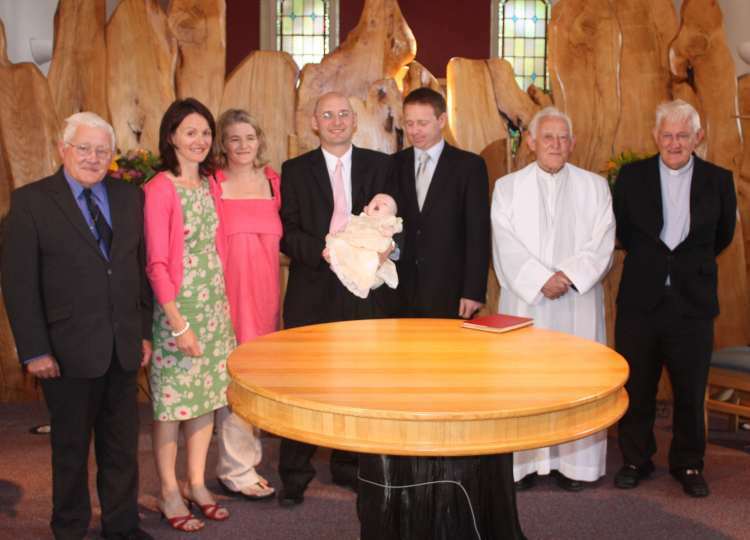 Catherine Nuala Hussey was baptised in Johnstown on Sat 31st July by her granduncle, Canon Tom Kelleher, Courceys. Catherine's mother, Kathleen, is a daughter of Jerry and Mary Kelleher, Deshure. Pictured above: Br Seán Kelleher, Killarney, uncle of Kathleen; Eileen Kelleher, godmother; Kathleen and Séamus Hussey with baby Catherine Nuala; Ian Bell, godfather; Canon Tom Kelleher, Courceys and Fr Jim Kelleher, Nigeria, uncles of Kathleen.